On a steamy summer day, Paul LaFrance sifted through a sea of memories inside the New Bedford home where his mother lived for more than 40 years. His mother, Barbara Plante, died at the age of 84 in April. As executor of the estate, LaFrance is in charge of gathering her possessions and deciding the future of the property. In her later years, LaFrance said he and other family members watched Plante battle early stages of dementia. So when LaFrance started going through his mother’s financial documents, he was stunned to learn at the age of 82—two years before her death—she had signed a 20-year contract for solar panels with Sunrun. The agreement locked his mother into $95 monthly payments to the solar company. She also continued paying utility bills for electricity usage beyond what the panels on her roof produced. For instance, her bill from Eversource last January was $96.04. LaFrance discovered his mom signed the contract after visits from a door-to-door salesman. When the NBC10 Boston Investigators contacted California-based Sunrun, the company defended its agreement with Plante, saying it trains employees to avoid overly-aggressive sales tactics. “We have stringent verification procedures to ensure our customers fully understand the service agreement,” spokeswoman Georgia Dempsey wrote via email. “Sunrun does not discriminate in our service offering to customers, including on the basis of age. Sunrun also said out of “good faith,” it waived late payment fees when Plante missed her first couple of monthly bills, saying she was uncertain about the online payment process. Rep. Shawn Dooley, a Republican state lawmaker, believes the solar industry needs more oversight. During the previous legislative session, he proposed creating a commission to study the industry and produce a set of guidelines to protect consumers. 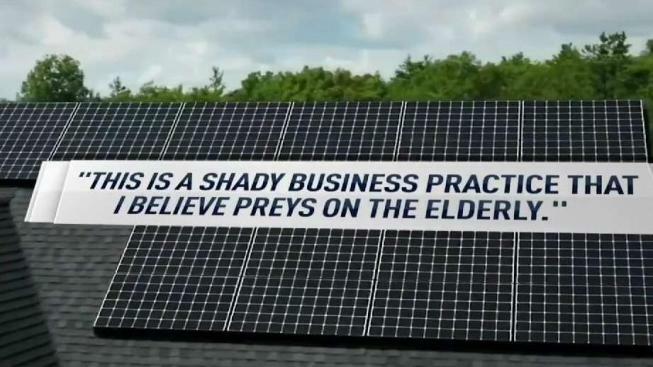 Dooley is far from anti-solar. He recently installed panels on the roof of his Norfolk home. Before moving forward with the project, Dooley said he got bids from ten different companies, hearing a wide spectrum of promises and energy projections. It made him realize how confusing the process can be, especially to more vulnerable consumers. The NBC10 Boston Investigators reviewed complaints about area solar companies submitted to the Massachusetts Attorney General’s Office in 2017. Out of the 230 consumer complaints, 40 percent of the people checked a box indicating they were over 60 years old. •	“I will be 85. Why would I sign a 20-year agreement?” a Millbury man wrote. •	“I believe I was deceived or conned into something,” a Leicester woman expressed. •	“He is elderly and hard of hearing and they completely took advantage of him,” a Worcester woman wrote about her dad’s experience. •	“I wonder how many others fall for this sales pitch, which I consider fraud and elder abuse,” an Oxford woman said about her contract. Dooley worries that examples like that will prevent Massachusetts from reaching its renewable energy goals. To bolster his argument, LaFrance obtained a letter from his mom’s doctor, a piece of evidence that he hopes will prove her fragile mental state when she signed the solar contract on February 27, 2016. “It is my medical opinion that during the period of time from January 2016 until her death, Barbara suffered from severe cognitive impairment and was not competent to make complex financial decisions and could have been easily exploited,” Dr. Robert Sawyer wrote. A Sunrun spokeswoman said the company is disappointed to hear about these issues now, adding that any verified proof at the time of installation in 2016 would have impacted the sales process. The company told the NBC10 Boston Investigators it will go “above and beyond” to assist with transferring the agreement to a new homeowner, if the property is sold. “Barbara got the value, savings and service expected from Sunrun,” the company said. For now, Plante’s family remains on the hook for the payments. Under the circumstances, LaFrance believes the agreement should be voided.